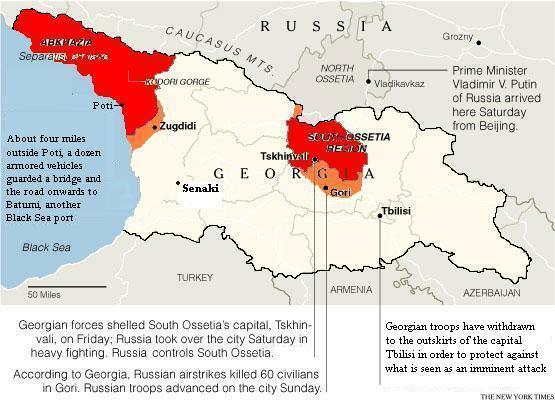 Russian president Dmitri A. Medvedev has ordered his country’s military operations to cease in Georgia. However he did not say his troops were pulling out of Georgia. He said the Russian troops will continue to fire upon any enemies in Southern Ossetia. Reports on the ground say that Russian troops are digging in around Georgian cities. There has been no cease fire yet. 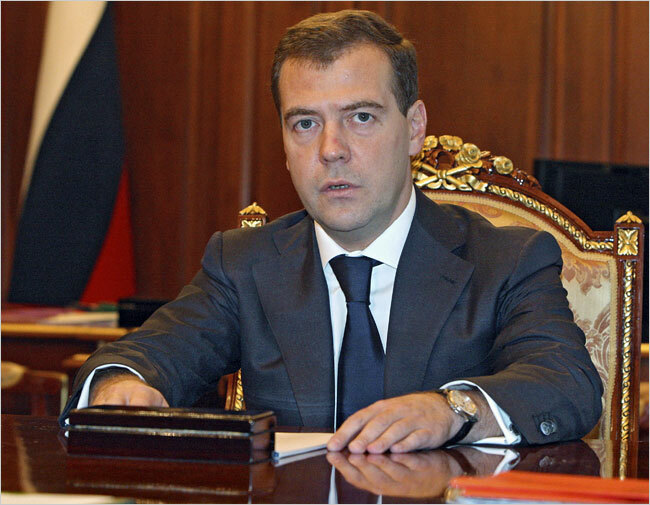 A Russian withdrawal will only come when a formal cease-fire has been reached added Medvedev. Only an hour after Medvedev spoke on television bombs were heard falling over the Georgian city of Gori, near Tbilisi. It seems that there will be no bull out of Russian troops from Georgia yet. We will have to wait and see what the Russian’s next move will be. We do however have new information on movements by the Russian forces, including paratroopers landing in a port city. Red are areas which Georgia does not control. Orange are areas which control over is disputed. This information is an approximation from all news reports. Information from a war zone is hardly ever 100% accurate. According to the New York Times about four miles outside Poti, a dozen armored vehicles guarded a bridge and the road to Batumi, another Black Sea port. The troops, who spoke Russian and wore patches indicating that they were paratroopers, said they were peace keepers. Today French President and acting European Union President Nicolas Sarkozy met with President Medvedev. Mr Sarkozy said he had received good news after talking with the Russian President, however the Russian Prime Minister Vladimir Putin was no where to be seen. Apparently Russia announced plans around 11:00am EST that they will pull out of Georgian territory. This after meeting with Nicolas Sarkozy. In other news, BP shut down two pipelines which run across Georgia full of oil and natural gas from the Caspian sea. However, the good news is…. oil prices did not go up. It seems the oil bubble has finally burst. Some good news among the violence and bloodshed. This entry was posted on August 12, 2008 at 10:58 am and is filed under Asia, Europe, International News, War. You can subscribe via RSS 2.0 feed to this post's comments.